2018 Excellence in Snow and Ice Control Award! Lake County recently received the 2018 Excellence in Snow and Ice Control Award from the American Public Works Association (APWA). The Lake County Division of Transportation (LCDOT) is proud to accept this award of national recognition for bringing an innovative, safe, and environmentally friendly snow and ice control program to the residents of Lake County. VIDEO: 2018 Excellence in Snow and Ice Control Award! At LCDOT, the safety of the traveling public is always the top priority. Winter weather can make traveling to and from work and school challenging. Additionally, emergency response vehicles need to be able to move quickly through the county. A well planned and properly executed Snow and Ice Control Program, incorporating the latest advancements in snow removal, keeps Lake County residents and businesses moving. In addition to the work LCDOT is doing, the Stormwater Management Commission and the Lake County Health Department support the snow and ice control program through training, river monitoring, researching best practices and providing educational opportunities to our regional partners. Lake County's snow and ice control program was evaluated in several categories, including the handling of materials, equipment, training, community outreach, technology, and environmental protections. LCDOT’s in-house liquid blending system allows for the adjustment of salt brine and beet juice ratios to meet various road conditions. This helps reduce the amount of salt used and allows the salt to be used more effectively. In partnership with the Stormwater Management Commission and the Lake County Health Department, Lake County hosts Annual Deicing Workshops to educate other public and private entities in the region on best practices. 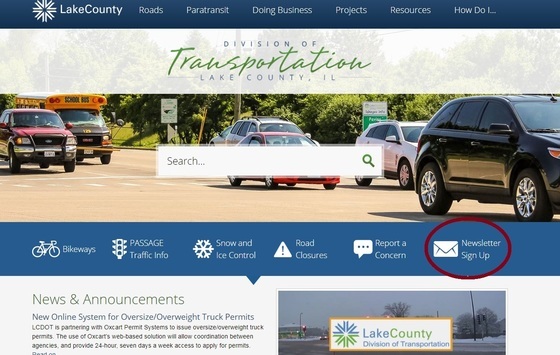 LCDOT keeps the public informed through a comprehensive public outreach effort using social media (Facebook and Twitter) and Lake County PASSAGE. Through the use of technology, LCDOT optimizes operations through real-time tracking of vehicle locations, deicing application rates, and reporting. Snow season officially runs from Nov. 15–April 15, but planning and preparation starts well before. The LCDOT maintenance staff spends several weeks testing and preparing the equipment, training drivers, and planning the snow removal response effort so that everything is ready when winter arrives. Outside of active snow season, the entire operation is carefully analyzed and adjusted to respond to changing conditions and advancements in technology. Team members look for opportunities to make internal improvements, and invest time and resources into educating others in the region. To learn more about Lake County's Award Winning Snow and Ice Control Program, please visit the website. Meet the Snow Plow Team! 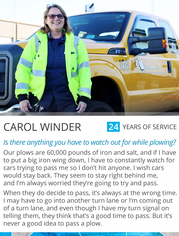 View our Snow Plow Driver Profiles to learn more about the men and women who keep Lake County motorists safe! Road salt and other deicing materials are needed to keep Lake County’s roads, parking lots and sidewalks safe, but the products used can impact our water quality. The Lake County Health Department, Stormwater Management Commission and Division of Transportation recently teamed up to offer deicing workshops to public agencies and private contractors to show how to wisely use road salt that will reduce the environmental impacts and help them save money. Watch this video to learn more. 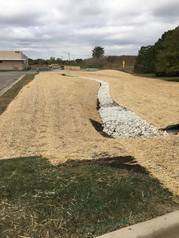 LCDOT, with the help of the Lake County Health Department and Lake County Stormwater Management Commission, recently completed a project to reduce salt runoff from the Libertyville Campus into nearby Bull Creek. Construction is complete on a new filtration basin to treat runoff from our salt storage areas. The basin is constructed with specially engineered soil that attracts and clings to the chlorides to contain them on our property to protect water quality in Bull Creek. LCDOT Announcements - Connect with Us! Soon we will be announcing the 2018 Construction Program! Please make sure you are signed up to receive our emails. Find the sign-up link on the LCDOT website.